Good afternoon, thank you all for joining us. Welcome to DTCC’s fourth European Client Forum. We really appreciate you taking the time to be with us today. It’s great to be in London again and to have an opportunity to get together with our clients to share our ideas and to hear from you. 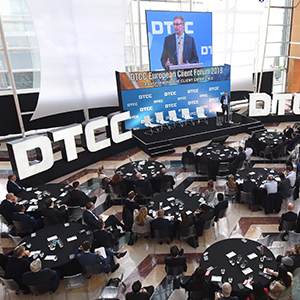 Collaboration is central to our mission at DTCC – it’s deeply ingrained in our DNA – so I’m excited for an interactive discussion on a topic of great interest to all of us – the intersection of technology and the client experience. So much of the debate on fintech today tends to focus on the technology itself. However, just as important are the underlying reasons why we’re all pursuing innovation so aggressively right now. To a large extent, it reflects the realities of the current environment – the need to reduce costs, to achieve regulatory compliance, to protect against new forms of risk and to stay relevant in a fast-moving and uncertain environment. I know that last point is felt more acutely here because so many issues around Brexit are still unresolved. However, there’s also another driver – maybe the most important one of all. It’s the client. Every discussion of fintech should start and end with the same question: How do we use technology to enhance the client experience and drive greater client value?